Using our state-of-the art technology, ScienceOpen will expose and integrate the context of these into more than 28 million existing article records. Combined with our brand new filtering innovations, this will provide a vastly enhanced and more precise research discovery experience. Clinical Interventions in Aging, a journal focusing on evidence-based reports on the value of treatments intended to prevent the onset of maladaptive correlates of aging in humans. The journal publishes articles addressing research topics like Alzheimer’s disease, Dementia, Osteoporosis, and Geriatrics. The journal encourages concise and rapid reporting of original research and reviews in aging. Drug Design, Development and Therapy, a journal that spans the spectrum of drug design and development through to clinical applications. They publish clinical studies in all therapeutic areas and outline programs for the development and effective, safe, and sustained use of medicines. 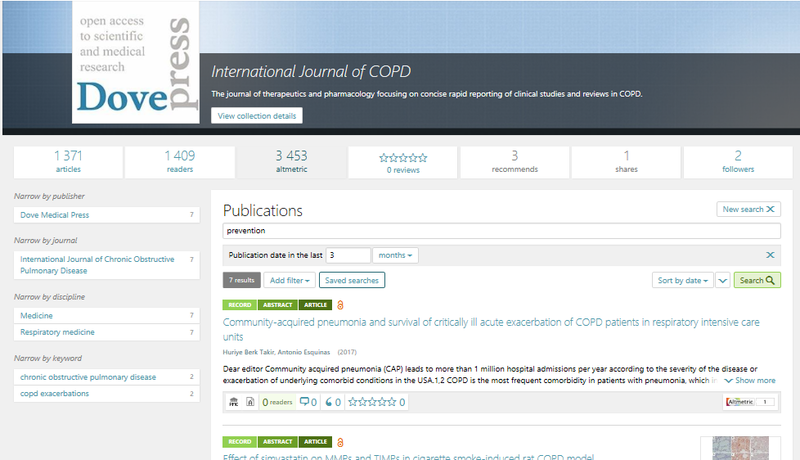 International Journal of COPD, a journal dedicated to the rapid reporting of clinical studies and reviews in Chronic Obstructive Pulmonary Disease (COPD). Main interests are: the pathophysiological processes underlying the disease, intervention programs, patient focused education, and self-management protocols. International Journal of Nanomedicine, a journal devoted to the study of the application of nanotechnology in diagnostics, therapeutics, and drug delivery systems throughout the biomedical field. The journal is highly prestigious and endorsed by the American Society for Nanomedicine. Journal of Pain Research, a journal welcoming laboratory and clinical findings in the fields of pain research and the prevention and management of pain. Neuropsychiatric Disease and Treatment, a journal focusing on concise and rapid reporting of clinical or pre-clinical studies on a range of neuropsychiatric and neurological disorders. OncoTargets and Therapy a journal specializing in the pathological basis of cancers, potential targets for therapy and treatment protocols to improve the management of cancer patients. The journal also focuses on the impact of management programs and new therapeutic agents and protocols on patient perspectives such as quality of life, adherence and satisfaction. Patient Preference and Adherence, a journal focusing on the growing importance of patient preference and adherence throughout the therapeutic continuum. Major areas of interests are: patient satisfaction, acceptability, quality of life, compliance, persistence and their role in developing new therapeutic modalities and compounds to optimize clinical outcomes for existing disease states. Therapeutics and Clinical Risk Management, a journal publishing clinical studies in all therapeutic areas, outcomes, and safety for the effective, safe, and sustained use of medicines. The aim of the journal is to report clinical studies in all therapeutic areas, outcomes, safety, and programs for the effective, safe, and sustained use of medicines. Being indexed in ScienceOpen, all these Dove collections are automatically synchronized with PubMed, which means that they continuously grow with integration of the latest published research. For example, from the beginning of February up to mid-March the total number of articles in the 9 Dove collections went up from 13.977 to 14.420, that’s an extra 443 articles in one field just from one publisher. In practice, it is very unlikely that researchers and professionals have the time, energy, and capacity to go through this ever-extending body of literature in the journal collections, most of which contain more than 1000 articles. And this is exactly the point where we provide you with increasingly powerful tools to make your life just that little bit easier. Our dynamic, multi-level search and discovery services operating also at the collection and journal levels, help you quickly and easily find exactly what research you are looking for. As a first step, we offer several and easy-to-combine filtering options. Users can narrow down their searches by title, abstract, author, keyword, publisher name, journal name, publication date range, collection, content type, record type and source. That’s a huge number of ways of filtering content to discover just what you want. Combined together with our brand new feature which adds extra search dimensions of affiliation, OA/non-OA content and ‘Indexed on ScienceOpen in the last X months’, research search and discovery has never been smarter or simpler. As a second step, you can sort the collections or the search results by publication date, and important usage statistics like citations, Altmetric score, and readership. This means that you discover not only the most relevant content to you, but then also to your research field. To put all this into practice, let’s assume that you would like to learn about the latest developments in the prevention of Chronic Obstructive Pulmonary Disease, so you decide to visit the collection page of the International Journal of COPD. In this case, all you have to do is type the keyword ‘prevention’ in the search bar and add the filter ‘Publication date in the last  months’. By doing so, you can easily narrow down the 1371 articles in the collection, from which 123 deals with prevention to the most relevant 7. Another cool feature on our search page is that you can save this search result list and retrieve it later, and in the future this will automatically update as new articles are integrated into the system. Other search engines like Google Scholar do this, but more en masse than the precision we offer at ScienceOpen. You can save the search result list and retrieve it later! The real power of the newly upgraded search engine, however, reveals itself when used on our entire research database of 28.5 million article records (and growing). For instance, adding Dove Medical Press to the ‘Publisher name’ filter will show you all the 26 982 articles we have imported from the publisher for now. These results are broken down to collections, journals, disciplines and keywords in the menu on left to help you to browse through these results at a glance. The next step of narrowing down this pretty long result list is up to you and your research interests! 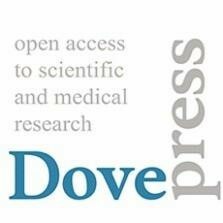 Do you want to check whether your colleagues from a given institution have published papers at Dove Medical Press? Add our brand-new affiliation filter! Or do you just want to keep track of the latest additions? Then choose the ‘Indexed on ScienceOpen in the last X months’ filter! By combining our 16 search filters, you can easily architect your very own search, and stay on top of the research tide. Our enhanced semantic search possibilities help both users and publishers to make the most of indexed content and enables us to easily browse through such mega collections as the above 9 from Dove Medical Press and find easily the most relevant pieces. Give it a go, play with it and tell us how you like it. What additional features can we add? What can we make easier for you all?